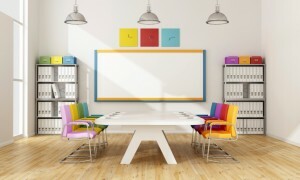 With the right color scheme, your office will look appealing and unforgettable. Offices tend to have boring, grey carpets and plain, white walls. It’s difficult to get potential employees and customers to feel excited about your business if their first impression is of a boring office. It’s a challenge to make an office space exciting, especially if you’re renting it. But there are certain ways to decorate your office that will leave your employees feeling motivated and your customers feeling impressed. A fresh coat of paint always makes an office space look brighter and nicer. You want to make sure that you are allowed to paint the space first if you are renting. Otherwise, paint away! 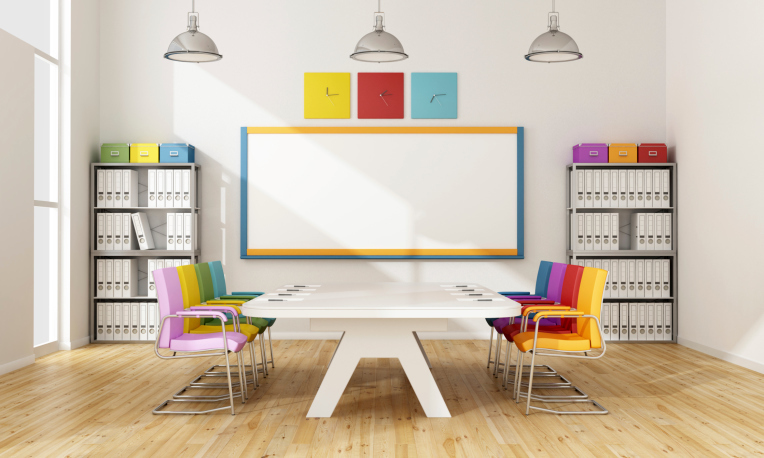 When choosing paint colors, it’s important to think of the theme throughout your office. If one room is green and another is orange and another is blue, it will begin to feel like walking through a fun house. Instead pick a solid color scheme of one or two colors and paint different, complementary hues of those colors. If you like a blue undertone, you can choose a few colors with blue undertones to run as a color theme throughout your office. Alternatively, you can pick a color scheme of three to five colors and accentuate different colors in each room. As long as the colors don’t clash and you have continuity, your color scheme should provide a natural flow throughout your office. When choosing colors, also remember to think about how you want to feel. If you don’t want to feel nervous, try to avoid alarming colors like bright red. If you don’t want to feel sleepy, avoid calming colors like grey. Of course, grey mixed with red accents would be just enough balance of calming and exciting colors. And if you are completely overwhelmed by color choices for the office, consider hiring a professional color consultant! We can help you to choose the best colors to represent your company and create a workspace that your employees will find energizing and motivating. The furnishings of your office space can go a long way. If you are using old desks and chairs, consider upgrading them. Not only will new office furniture look great, it will also make your employees feel more energized and productive. Well-designed office furniture can save space, keep things more organized, and even be healthier for employees. Many new office furniture is designed to be ergonomic, or, it fits to the natural shape of the human body. Ergonomic furniture will prevent your employees from developing chronic health conditions that come from repetitive labor. When choosing your furniture, remember that it should be neutral colors or colors that are within your color scheme. An office with a color scheme of blues and greys would look terrible with lime green chairs, no matter how new and chic the chairs are. Also keep your color scheme in mind when choosing window furnishings! You can go with plain, neutral blinds or choose curtains made with a fabric from our selection that matches your office’s color scheme. Visit Columbia Paint Company to look through our extensive fabric library.